Greetings again from the darkness. Part of the fun that goes with watching a filmmaker’s feature film debut is the hope and optimism that precedes the viewing. At a minimum, we expect to see something original – something … anything … that inspired this person to overcome the many obstacles to getting a first film produced and distributed. Unfortunately, the opposite is true for the first feature from writer/director Joshua J Smith. The material is a mixture of films and characters we have seen too many times before. Charlie Stillman is a New Jersey boy who dreams of following in his deceased father’s country and western footsteps in Nashville. Armed with a guitar, his dad’s notebook, and nary a clue, Charlie heads south. Rather than open a door, his father’s legacy slams it shut in Charlie’s face. Circumstances are such that he agrees to fly to Seattle and drive honky tonk legend Buckshot Thomas cross-country for his farewell performance in Nashville. What follows is a typical road trip movie taking place in a battered RV, with a crusty old curmudgeon and a kid who thinks “bro country” music is his ticket to paradise. To no one’s surprise, the generational gap closes quickly as Buckshot offers up life lessons designed to create authentic songwriting tips for Charlie. 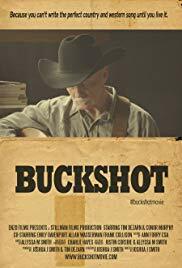 In exchange, Buckshot makes some unscheduled personal stops along the way – saying goodbye to the past, with sequence involving a drug dealer, gun play, a guitar-whisperer, and gallons of booze. A half-baked love story is little more than a blip; although there is a quite touching scene in a cemetery, as Buckshot pays his final respects to family, and we learn the story behind his first hit song “Darlin’ Eyes”. And that’s really what this movie has to offer: Tim DeZarn stars as Buckshot, and his performance makes the character more interesting than the script would have us believe. You’ll surely recognize Mr. DeZarn from many roles over the years in TV and movies, but I don’t recall his taking such a strong lead. Frank Collison plays the guitar mystic and old friend to Buckshot, while Allan Wasserman is the blustery club owner, and Emily Davenport the fringe love interest. Conor Murphy seems to lack the presence to rescue such a poorly written character, but the biggest disappointment comes from the missed opportunity by filmmaker Smith. It’s prime time for a statement on the devolution of true “outlaw” music and musicians into the mainstream sludge that passes as country music these days. Instead of playing it safely in the middle of the lane, a true outlaw movie with guts could have labeled Mr. Smith as an exciting and daring new filmmaker. No wonder Buckshot carries that smoke wagon. Greetings again from the darkness. Well I was not ready for the horror/zombie/slasher genre to be turned on its ear, but that’s exactly what co-writers Joss Whedon and Drew Goddard (also director) have done here. Rest assured that your favorite aspects of horror films will be lampooned, or at least parodied. There are times you will jump and laugh simultaneously, but mostly I found myself checking off the influences/targets of the filmmakers. There is no way to comment on this film without offering up spoilers, and I will not do that. What I can tell you is that you’ll be reminded of films such as Scream, Friday the 13th, Bubba Ho-Tep, Night of the Living Dead, The Evil Dead, Saw, and dare I say, elements of the classic TV series The Twilight Zone … you know the parts where you know there is more going on than you are seeing, but you can’t quite put it all together. The movie starts out with a tongue-in-cheek assembly of generic characters from most horror films: the fun-loving jock (Chris Hemsworth, pre-Thor), the “bad” girl (Anna Hutchison), the “good” girl (Kristen Connolly), the brainiac (Jesse Williams), and of course the comic relief stoner waxing philosophical (a very effective Fran Kranz). This group piles into a borrowed RV and heads to the cabin. And yes, we get the obligatory stop at the run down gas station manned by the straight-from-Deliverance attendant played by tobacco-spitting Tim De Zarn. We learn quickly that something odd is going on and our heroes are really playthings in some kind of cosmic game being conducted at an underground lab run by Richard Jenkins and Bradley Whitford. That much is shown in the trailer and that’s the end of what I will say. After that, the choice is yours … just like in the basement. I have no idea whether to recommend this movie, and if so, to whom. The last 15 minutes are pure mayhem, and you will either be fully onboard with this Disneyland ride gone bad, or you will have wanted to leave for the past hour. Filmed three years ago, but caught up in studio legalities, the movie was selected for opening night at SXSW and it truly is a twisted, even demented jab at all things horror. Only you can decide what comes next. SEE THIS MOVIE IF: your twisted, demented movie-watching personality has made you a horror/zombie/slasher expert and you don’t mind Whedon and Goddard poking a little fun at your genre … just don’t blame me.